Like dampfnudeln, Austrian germknodel are a "mehlspeise," or flour-based meal served in German-speaking European households for lunch. "Germ" is the Austrian word for yeast, and these yeasted dumplings hide a surprise inside. A spoonful of "powidl," or plum butter, is placed on the dough, which is then formed into a ball. Served either with melted butter or vanilla sauce and poppy seeds crushed with sugar, germknodel are especially popular at Austrian ski resorts. Try these dumplings on a cold day, after a bowl of vegetable soup, for a delightful meal. Mix the instant yeast with the flour, sugar, lemon zest, vanilla sugar, and salt. Add the egg, softened butter and milk and mix, using a dough hook or with a spoon by hand, until a medium-soft dough forms. If you are using a mixer with a dough hook, you can continue kneading in the bowl with the hook until the dough is smooth and elastic. Adjust flour or milk as needed to make a pliable but not sticky dough. If you are making the dough by hand, turn it out onto a lightly floured board and knead until it is smooth and elastic. If the dough is too stiff, knead with wet hands until it becomes softer. Form the dough into a ball, flour lightly and place in a bowl to double in a warm place. Cover with a clean towel. Let it rise about 1 hour or until it has doubled in size. If you are adding rum and/or cinnamon to the jam, stir it together now. You can use any jam flavor or cherries or Nutella, too. Remove the dough from the bowl to a lightly floured board. Pinch off 2-ounce pieces; you can make them larger, but they will take longer to steam. Roll the pieces into a ball and then flatten them with your palm to form 4-inch circles. Add 2 teaspoons of the jam filling to the center or each ball of dough and then pull up opposite sides and pinch closed. Pinch the other two sides closed and make sure the jam is well-sealed inside the dough. Roll the dumplings bit in your hands to round up the dumpling. Set the dumplings on the floured board, sprinkle with flour if you wish, and cover with a cloth. Let them sit 10 to 20 minutes. If you have a Silit pressure cooker, grease the steamer insert and put in 3 dumplings at a time. You could also use a bamboo steamer or a metal vegetable steamer covered with a cotton cloth cut to fit. Place 1 to 2 inches of water in the pan, hang the steamer over the water and bring to a boil. Place the dumplings on steamer over boiling water, leaving about 1 inch of room to rise in all directions. Cover the pan and steam 20 minutes in several batches. Grind equal amounts of poppy seeds and sugar in a poppy seed grinder or a blade coffee grinder. Set aside. Place 1 or 2 dumplings on a plate and pour melted butter over the top. Sprinkle the poppy mixture over the top, as desired. You can also make the vanilla sauce while you are waiting for the dough to rise. 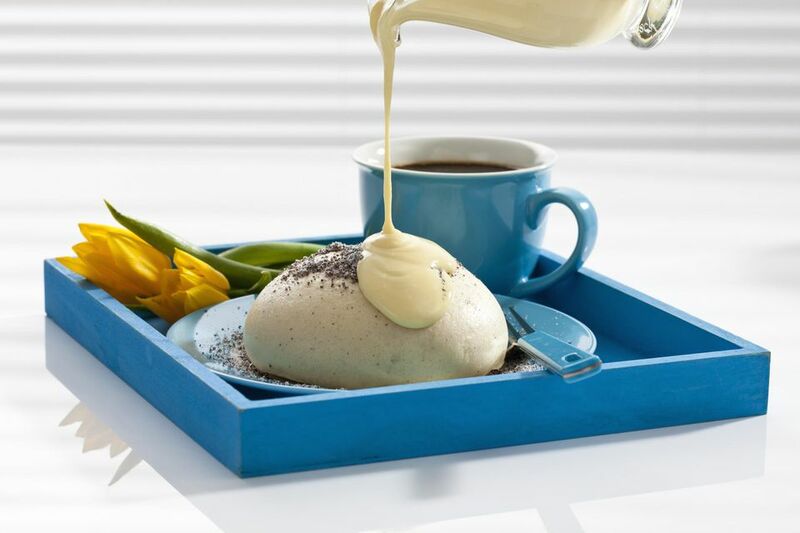 Pour the vanilla sauce and poppy seed mixture over the top when you are ready to serve. You can substitute cake yeast or regular dried yeast for the instant. Proof both types in the milk before adding to the flour and other ingredients. Also, you can also use the poppy seeds whole to save a step. If this makes too many dumplings or you don't want to steam them right away, you can place them in the refrigerator for later. You can also bake these into sweet buns: Melt 1 to 2 tablespoons butter in a 9- by 13-inch dish, arrange the buns seam side down with a little space between them. Let them rise a few minutes, then bake at 350 F for 25 to 30 minutes. Drizzle a little frosting on top and you have a wonderful breakfast bun.